In the past three years, Carissa Mallory has worked to provide schools in Tanzania with resources to help Swahili-speaking students learn English and thereby advance to secondary school. RecognizeGood was just sent down to us, and I’m honestly just so humbled for this opportunity. 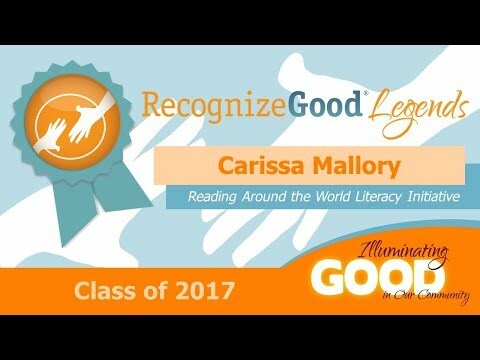 Carissa Mallory, a recent graduate of Vandegrift High School, began her initiative after learning that English language skills often proved to be a barrier to pursuing a high school education in Tanzania, and decided to found the Reading Around the World Literacy Initiative (RAWLI). Carissa’s efforts have provided more than 12,000 books, 350 desks and chairs and an educational app to help Swahili-speaking students learn English. Looking back to three years ago, Mallory recalled meeting with the education attaché at the Tanzanian U.S. Embassy. “I was a little intimidated because the staff wanted to talk directly with me since RAWLI was my project; I was only 14-years-old. I did my best to advocate for the kids of Tanzania and asked the Embassy to help get more books for them. “I was amazed and excited when in the following spring, they had arranged for a huge donation from the United States of 1.5 million used textbooks. As a result, I learned that even a young person could be an effective advocate for a cause in which they believe. You’re never too young to use your voice to effect change,” Mallory says. At the Gerezani Primary School, the English literacy grade point average has increased from 2.0 to 2.99. As Tanzanian schools, and especially Gerezani’s 400 students, are poised to make the most of their new resources, Mallory is poised to continue pursuing her dream as she enters the University of Texas McCombs School of Business this fall. “I feel compelled to continue to help. I have a dream now to start a social enterprise along the business model of TOMS shoes, but instead of giving away shoes, we’ll give away books and technology,” she says.